Our new 4-Port SuperSpeed USB 3.0 Hub from quickly adds four (4) additional USB 3.0 ports to SuperSpeed USB 3.0 enabled computers. The hub maximizes data transfer speeds when using higher-bandwidth peripherals including external USB 3.0 digital video cameras, disk drives, video surveillance cameras, high-resolution webcams, and multi-channel audio. The 4-port model supports USB 3.0 data transfer speeds up to 5Gb/s and provides backwards support for USB 2.0 and USB 1.1 devices. The 4-Port SuperSpeed USB 3.0 Hub works with a wide range of USB devices and allows simultaneous operation of multiple USB 3.0 and legacy USB devices. 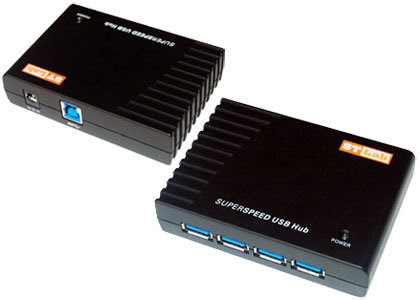 The 4-Port SuperSpeed USB 3.0 Hub comes with a 2 Ampere power supply for USB devices requiring bus power. All specifications and prices subject to change without notice. All trademarks and trade names referenced are properties of their respective owners. © Copyright 2010 EverythingHerePlus.com, all rights reserved. Reproduced with permission.